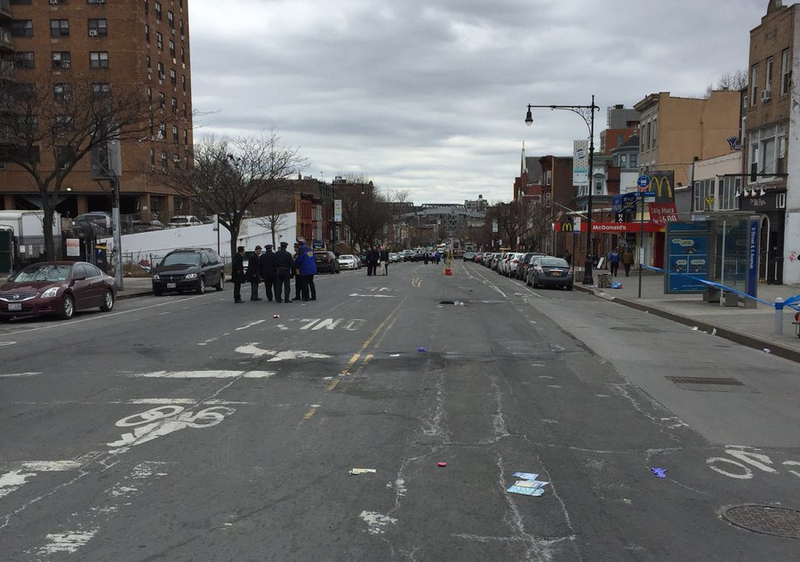 The mayor made no promises today, as his daily SUV convoy to the Park Slope Y took him within a few feet of the site of yesterday's fatal collision. More than 100 people showed up outside the Park Slope Y this morning to tell Mayor de Blasio to redesign 9th Street, the neighborhood main street where Dorothy Bruns ran over and killed 19-month-old Joshua Lew and four-year-old Abigail Blumenstein yesterday. 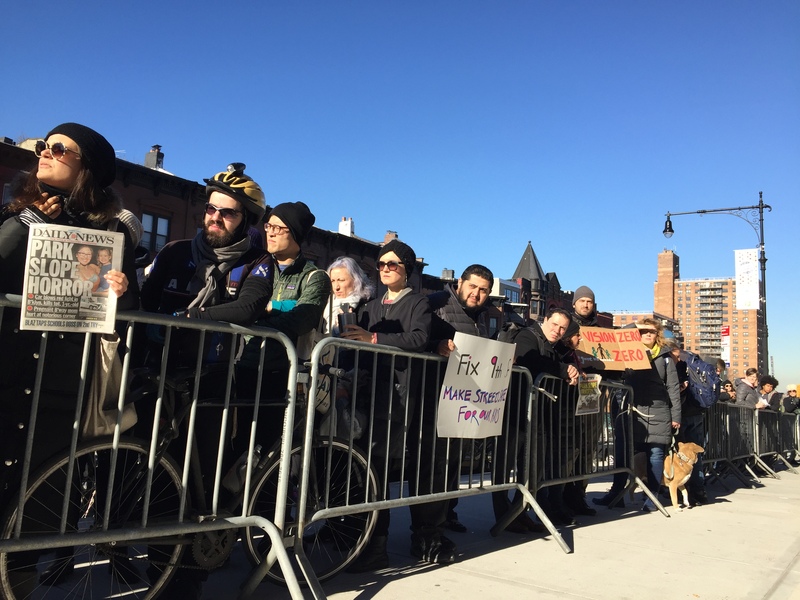 Demonstrators called on the city to immediately redesign 9th Street between Third Avenue and Prospect Park with protected bike lanes and concrete pedestrian islands. The intersection of Ninth Street and Fifth Avenue has an especially awful record of crashes, injuries, and deaths. In 2016, a hit-and-run driver killed 41-year-old Bahtiyor Khamdanov. Later that year, a car crashed into a discount store near the intersection, injuring four people. That year a driver also critically injured a cyclist at the intersection of Ninth Street and Sixth Avenue. As de Blasio approached the gym this morning, he stopped to talk with Gordon, who urged him to commit to redesigning the street with protected bike lanes, concrete pedestrian islands, and other safety improvements. Gordon said de Blasio declined to make any explicit commitment. A 2007 redesign of Ninth Street added unprotected bike lanes, but the street remains wide and vulnerable to speeding. “We’ve been asking for this street to be fixed for years, and it hasn’t been fixed,” Gordon said. Can’t argue with that. Why wait for a horrible tragedy that a street redesign could have prevented to implement it? There is one qualm, however. The goal of slowing traffic is at odds with the goal of speeding up buses. Designing a 55′ wide two-way street with parking-protected bike lanes, bus stops, and left turn pockets is the easy part. Designing protected intersections along Ninth Street that accommodate buses, pedestrians, cyclists and car drivers is less easy, but totally doable. Finding the political will to actually step up and implement either of those plans is, of course, the hard part. Bravo to Doug Gordon and everyone involved in setting up and participating in this rally. Good points. Unless Ms. Bruns is a total sociopath (can’t rule it out) she may very well regret her choices now, but it’s too late. Perhaps an intervention might have prevented this. But the vehicles themselves are now capable of preventing something like this, as the car companies are happy to show in their commercials. This ought to be made mandatory. Mayor should mandate that going forward all new city vehicles will have pedestrian collision avoidance technology. Could also require it for fleets and for-hires in the near future. It’s only a matter of time before the next person is struck and killed, this technology reduces that likelihood on for a large portion of on street vehicles. Earlier this week, Mayor de Blasio faced a crowd of his Park Slope neighbors calling for immediate safety improvements on the street. The location has a history of serious crashes, and is mere feet away from the Park Slope YMCA where Mayor de Blasio is driven to his morning workout each day. Council Speaker Corey Johnson told the crowd "we will do everything we can within our power" to prevent the loss of life. Amsterdam Avenue: a roadway that Community Board 9 has consistently prevented from being redesigned.